In addition to the illustrated new menus, the new iPods also show a capacity bar similar to the one that appears in iTunes for connected devices. Under the Settings/About menu, the capacity bar presents a visual thermometer of how much memory is being used by audio, video, photos, or "other," and how much is left free. Click and it shows a numerical listing of how many individual songs, videos, podcasts, photos, games, and contacts are loaded. A third click shows the software version and the unit's model and serial numbers. Also found under Settings are the typical iPod Settings menus, enhanced with new graphics. For example, the EQ settings depict graphic equalizer settings to provide a visual sense of what impact they will have on the music being played. Graphic controls also make it more obvious what certain settings do, even for non-technical users. Hidden in the Extras menus are updated versions of the standard iPod mini-apps. Everything from the stopwatch to the security lock is revised and refreshed with subtle refinements. The new world clock shares similarities with the iPhone. Despite lacking touchscreen control, the Nano's clickwheel and intuitive on-screen prompts make it nearly as easy to set things up. Clicking reveals a menu choice to edit the existing clock or add a new one. Three clocks can be displayed on the screen; additional ones can be set up and scrolled through. There's no way to sort or move around clocks on the screen; instead, you have to select a clock and edit or delete it, one at a time. Under Calendars, there are options to view All Calendars, To Dos, and Alarms. 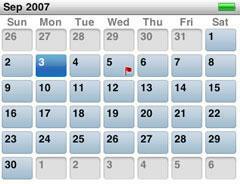 Calendars work like the earlier iPods. There's no event list or daily view like the iPhone, only a monthly calendar that can be scrolled through to look at individual day's events. To Dos appeared to be a placeholder waiting around for Mac OS X Leopard to ship, but it did import my To Dos from iCal, something the iPhone oddly doesn't handle at all. The Alarms option sets whether to play beeps or not for scheduled alarm events in the calendar; setting Alarms is done from a separate menu. That Alarm menu lets you set a sleep timer that plays music for 15, 30, 60, 90, or 120 minutes before shutting off, depending on how quick you conk out. You can also Create Alarm by setting a specific date and time, or enter reoccurring alarms that go off every day, every week, on weekdays, or weekends, every month, or every year. Alarms can be set to beep or play a Playlist. There's no obvious way to add new alarm sounds, but it appears that additional sounds will be added using the new iTunes ringtones. 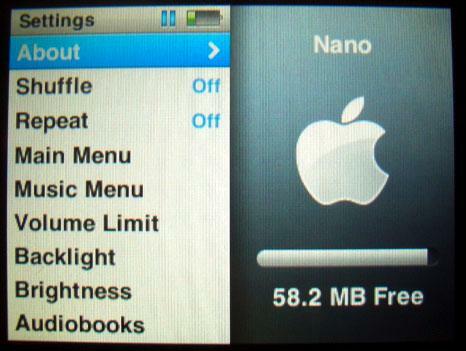 Within the files visible on the Nano in disk mode is a folder of Tones, which only includes the Beep.tone file. Adding Tones will likely be the job of the new iTunes with support for officially licensed RIAA Ringtones, which Apple negotiated down to a 99 cent premium over existing purchased songs. Other providers charge $2.50 or more for a ringtone. It's easy to copy files onto the iPods in disk mode, so once enterprising users figure out how to create tones that play on the Nano, it will be an easy matter to copy them over. I prefer subtle alarms that just vibrate. Alarms can also be assigned Labels, including Wake Up, Work, Class, Party, Meeting, Anniversary, Prescription and the like. The Nano's Alarms therefore appears to be a simplified way to set up new calendar events on the device. Since it doesn't have the iPhone's screen real estate to support a full calendar interface, the Nano's Alarms panel makes it easy enough to enter simple calendar events without being so convoluted that it makes no sense to use. There is no obvious timer function equivalent to the iPhone's, but one could set an alarm set for a time ten minutes into the future or whatever is desired. Contacts and Notes sync in from a connected PC, but there's no way to enter either from the Nano. Contacts sync via iTunes as expected, and Notes remain something users have to manually copy over by putting the iPod into disk mode and then dragging text files over. It appears Notes will gain full functionality with updates related to Leopard, which elevates Notes and ToDos into system-wide functions integrated into the new Mail. That will hopefully make Notes more useful for iPod users; currently they aren't. The Nano's Stopwatch handily beats the iPhone's version in that it logs all the lap timers you set, allowing you to time a regular series of events and review all the settings later. Start it, then every time you click you get a lap timer. All those laps are recorded to logs by day, allowing you to review stopwatch logs from previous days. This sports-oriented stopwatch also fits into the Nike+ positioning of the Nano. I have good hearing, and found the maximum volume uncomfortably loud. Its therefore handy that the Settings allow you to set a maximum volume, so you dont inadvertently destroy your hearing by zipping the volume up past a reasonable level. The use of other types of headphones might reduce the volume, as some headphones require more volume that the earbuds Apple provides. On page 4: Physical Features; and Syncing and Software Issues.